We had multiple request from VIP security, contractors and LE guys to build a low profile AR chest rig that could hold 4 mags. A 5 mag version is now available as well. Since this picture we have made a few modification to tighten up the rig a bit and expose more of the mag. The two outside pouches have additional space to fit a handgun or radio making the low-profile chest rig more functional. 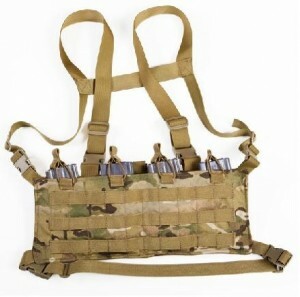 We were able to keep the three rows of molle for attachment pouches. This is a tight little rig and is design to be functional and simple. It is the smallest 4 mag AR chest rig on the market today. Just like on all of the BCS chest rigs the H-harness or X-harness is available for personal preference. The Recon/LE AR Chest Rig integrates four or five internal pouches for a single 5.56 magazine held securely in place with an adjustable bungee system. Three rows of MOLLE webbing across the expanse of this rig allows the individual to configure it for mission needs with any molle compatible pouches. Large rear pocket allows for extra storage of additional items. H-harness shoulder strap design. Very light weight and low profile. The Recon rig is available in Multicam, A-TACS AU, A-TACS FG, Kryptek Highlander, Kryptek Mandrake,Coyote, Ranger Green, Khaki, Woodland, OD and Black.